Gaumont-British trade-showed The Man Who Knew Too Much, along with four other titles, to UK exhibitors in late November 1934. Highest hopes were pinned to a George Arliss historical, The Iron Duke, which saw US release, but others of the group had mostly Brit isles appeal, The Man Who Knew Too Much thought worthy of a crossing thanks to what Variety's London correspondent called "one of the most important casts in some time." 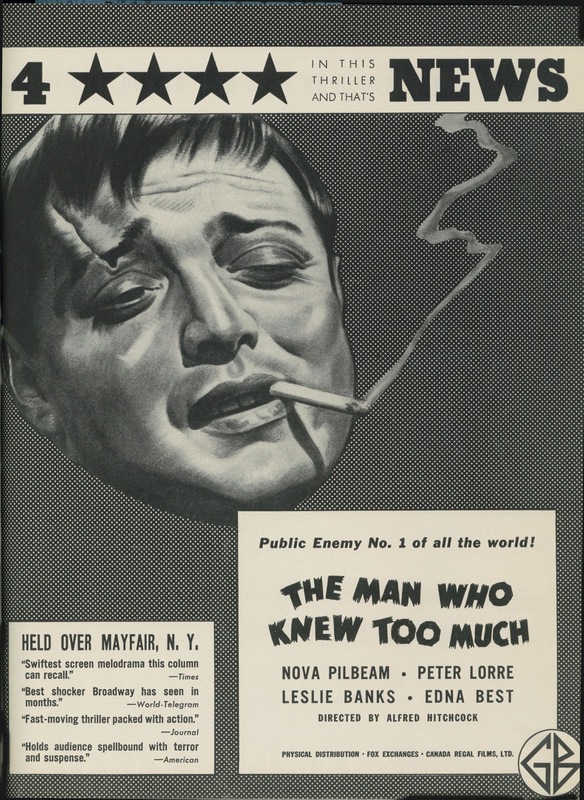 Early March 1935 saw trade ads beginning to US-appear, Gaumont advance- promoting The Man Who Knew Too Much along with Arliss, a yet untitled Conrad Veidt vehicle, plus harder sells Jack Hulbert and singing Jan Kiepura. Said ads pushed "Public Enemy No. 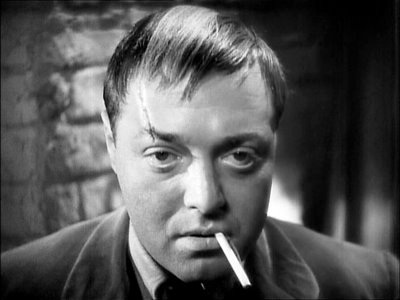 1 Of All The World" Peter Lorre as "The Arch Criminal Of All Crime ... Of All Time." 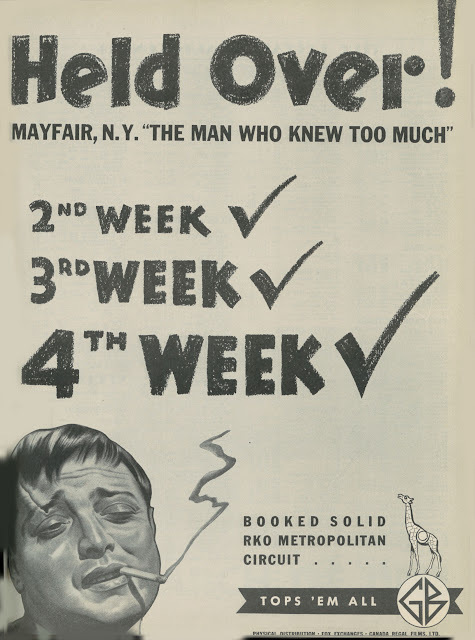 Gaumont's release date for The Man Who Knew Too Much, with prints distributed via Fox exchanges, was set for 4/15, this following 3/22 premiere at Broadway's Mayfair Theatre (2,200 seats). The British cinema, never known for its command of filmic pace, goes in for a blistering style of story-telling in The Man Who Knew Too Much, said The New York Times in its 3/23/35 review. The backhand complement was assurance that this was not your ordinary (read dull) UK import, Hitchcock's staccato violence making for a swiftest melodrama since Warner's Fog Over Frisco. The director had risen above photography and lighting said to be inferior in comparison with Hollywood effort, said the Times' Andre Sennwald, a condescending posture US critics routinely took with regard imports. A follow-up article (3/31) called Peter Lorre "Poet Of The Damned" in accord with Gaumont hopes that his performance in M would be remembered and lure trade to The Man Who Knew Too Much. The Mayfair's third week got further attention for an off-shore show hanging on so long, a Times' 4/7 column titled Meet London's Mr. Hitchcock. Here was occasion for the newly hot director to air views on melodrama and how he'd redefine it. "Antique devices" are out, said the "rotund, many-chinned" Hitchcock as he persevered on a newest, The 39 Steps, a spy successor hoping to out-thrill The Man Who Knew Too Much. The bar was high for Brit pix beyond urban and sophisticated environs. Despite a common lingo, they carried an onus bad as ones attached to foreign talkies from elsewhere. Brit native and booster of all things from there Bill Everson wrote of barriers to US acceptance of UK product: For the most part, they were too long, too slow, too dialogue-ridden, and too crude technically to match American and the best European sound standards. Everson felt it was 1932-33 before Britain began regaining lost ground. 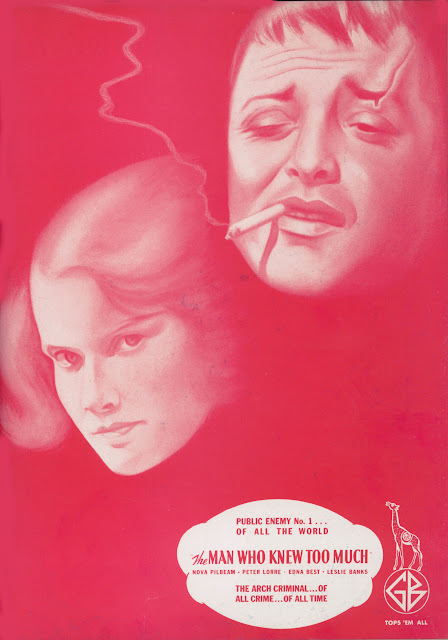 Success for Korda's The Private Life Of Henry VIII in 1933 would demonstrate strides that The Man Who Knew Too Much confirmed (though there had been trade raves for an excellent UK thriller, Rome Express, distributed by Universal in 1933, but it didn't have so much exposure as The Man Who Knew Too Much). Variety's review of The Man Who Knew Too Much acknowledged a paucity of names for the US, but said it ought to please audiences provided they could be coaxed in. There was expected dig at British idiom: A cop walks on and says, "I'd rather be on point duty." That's alright in London, but who in New York knows that what he's trying to say is, "I'd rather be a traffic cop." Such was abiding curse on imports: America's demand that they adhere to our customs and speech, an expectation as unreasonable as it was impossible to fulfill. New York's Mayfair success was a surprise, with a "very good" $11,000 in its first week, $8,000 "or thereabouts" for a second, that estimate adjusted up when word-of-mouth brought the total to $11,000, that equal to the first frame and assuring there'd be a third. The total of four Mayfair weeks, remarkable for an outsider pic with no major names, was trade-trumpeted and led to circuit bookings and willingness of other key cities to have a go. Manhattan huzzahs must not have been heard in Brooklyn, however: their 4,000 seat Fox Theatre took a chance with The Man Who Knew Too Much and a stage show to an "unexciting" $12K for an opener week (larger auditoriums meant greater numbers needed to fill them). A customer complaint to Fox management cited a "shooting and killing" scene in The Man Who Knew Too Much followed immediately by afternoon tea, an "English custom," said Variety. The irate patron wanted a refund for the "abrupt transition," claiming that the picture "had been cut." Business elsewhere for The Man Who Knew Too Much was promising, Variety by September referring to it as "the first action film from England." A "going strong" combo of Too Much and Columbia's White Lies saw the pair filling in for a withdrawn Bride Of Frankenstein, the chiller's slump in its last two days prompting a bum's rush out of Buffalo's Lafayette Theatre. 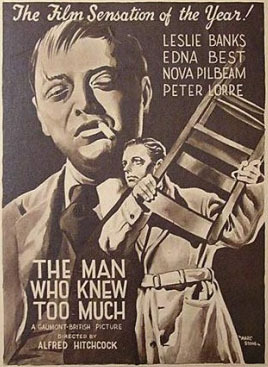 Peter Lorre build-up was credited with "brisk" trade at the Warner in Pittsburgh, and "critical raves" helped The Man Who Knew Too Much score well in Philadelphia. Further west dates varied. San Francisco acknowledged rhapsodic print response for the Hitchcock thriller, but reviews never pull Joe Doakes into the films in this man's town, said Embassy Theatre management. 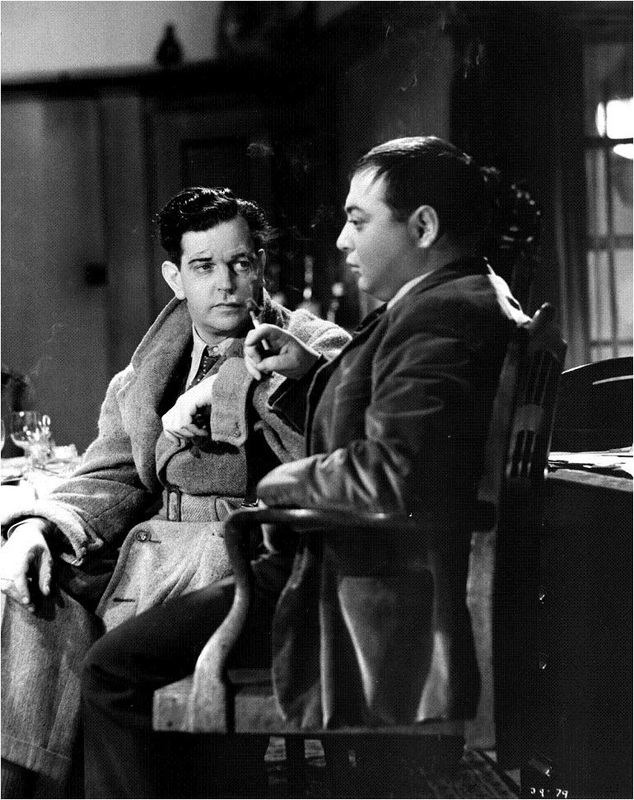 Lincoln, Nebraska's August play at its Varsity Theatre had The Man Who Knew Too Much playing in opposition to next door Colonial's run of Peter Lorre in just-released Mad Love. PL's novel take on villainy was probably what gave The Man Who Knew Too Much much of success it enjoyed, at least in Middle America play-off. Real-life events tied in to enhance Seattle's run. The Tacoma kidnapping of a nine-year-old boy in May 1935 preceded The Man Who Knew Too Much by mere weeks, and the Orpheum capitalized heavy on ways the film linked with ongoing headlines. By June 1, little George Weyerhaeuser had been recovered and The Man Who Knew Too Much was about to open. 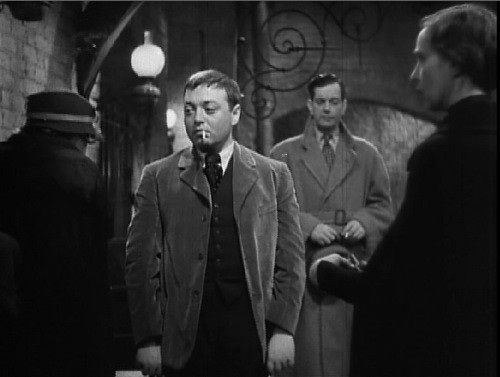 Playdates coincided with investigation and capture of the gang, our FBI's efficiency not unlike that of London police closing in on Peter Lorre's child-snatching bunch. Was Hitchcock made aware of serendipitous circumstance of Seattle's Man Who Knew Too Much booking? If so, he'd have been at the least amused, if not inspired to fake a similar event when time came to bally 1956's remake. I wouldn't put that past such a consummate showman as Hitchcock. The 1934 version of "The Man Who Knew Too Much" was another of the films I saw as a young man at the Temple University Cinemateque in Philadelphia. It was during the heyday of the reperatory theaters, when every week brought the possibility of discoveries that were not available even on the UHF television stations of the time, with their packages of odd and obscure films. I had become a Hitchcock completest by then, and was of course familiar with the 1956 version from its network airings, so I very much looked forward to seeing its earlier incarnation. In truth, though, I was disappointed by it. Possibly it was the quality of the print I was watching, but the production itself seemed cramped and dingy, as though the walls of the small studio were just outside the range of the camera and there had been a rationing of the electrical power available. The Swiss settings in particular were unpersuasive. 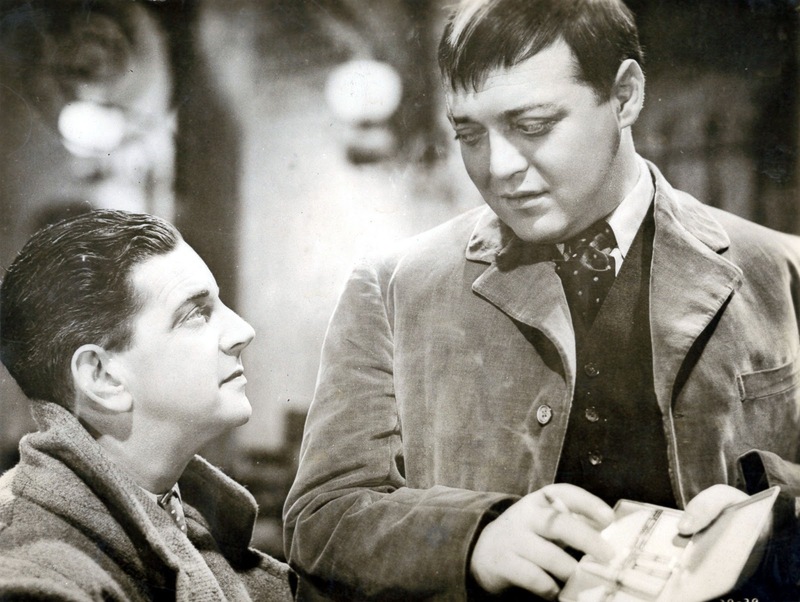 Even so, it was an entertaining show, especially in the person of Peter Lorre, whose charm and good humor made it seem almost a shame that all his plans had come to no good end. 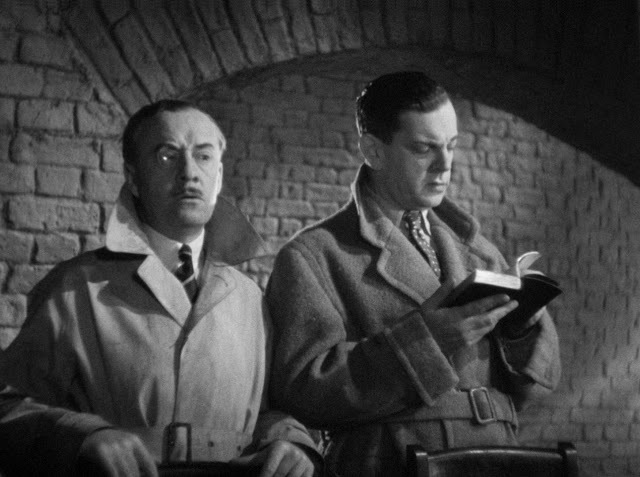 I also appreciated the quirky "Britishness" of the story, as in the utter surprise of a London police sergeant when one of his men, unarmed, as were all the "Bobbies," but trying to force the door of the hideout, is shot down. That apparently just wasn't how the game was supposed to be played, either by the police or the criminals, so that the villains, doing such dastardly deed, further marked themselves as the scoundrels and outlaws they were. Compared to the later American version, however, it seemed that Hitchcock had improved upon his first thoughts. Certainly James Stewart and Doris Day were more American and thus, more emotionally open and vulnerable than Leslie Banks and Edna Best. This gave the version they appeared in an underlying tension that more than made up for the tighter plotting of the original. Doris Day singing "Que Sera, Sera" was to be preferred to Edna Best's cool marksmanship. Or so it seemed to me at the time. Would I hold to that opinion now, if I could see this newly mastered DVD of the original? Possibly, but it would certainly be worth re-visiting it. I'm second to none in my appreciation of Peter Lorre, but I think in appreciations of this picture the contribution of Leslie Banks is undervalued. He is quite terrific -- and one wonder why he was not used to better effect. 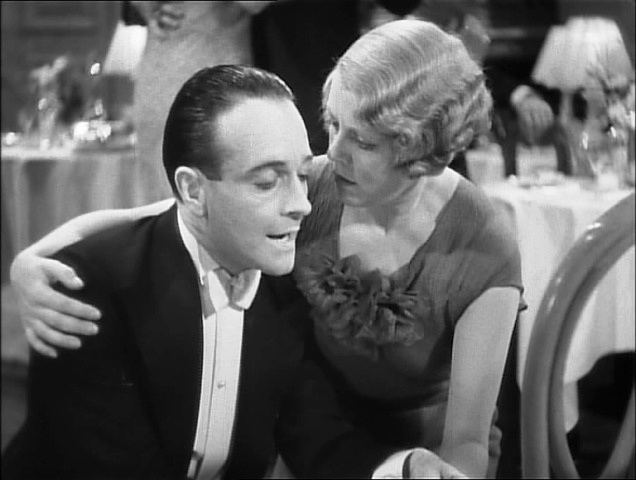 He had some terrific roles in the early 30s (e.g., The Most Dangerous Game), and then seemed to fade into supporting parts. That is, I think, a shame. What a Bulldog Drummond he would have made! 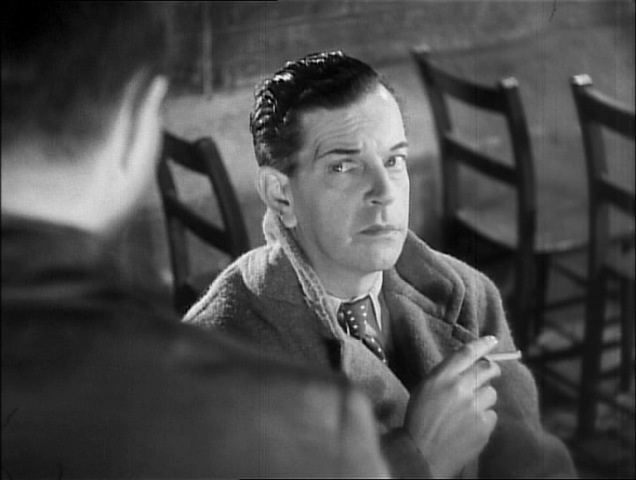 I'm not sure how Leslie Banks could have been used to better effect in films, considering he was primarily a stage actor, didn't really get into motion pictures until he was over forty, then continued to work well in movies pretty close to his death in 1952. What I find more amazing and wonderful about his career was that he was badly disfigured facially in the First World War on one side of his face, but still had a long and successful career on stage and film. I doubt he would have had the same sort of career in America, where looks are everything, especially these days. I doubt he would have even been considered for American films if he hadn't had a name on the stage already in the late 20's and early 30's. I think I have to agree that the first MAN WHO KNEW TOO MUCH does have the edge on the second one, but I have always enjoyed both, because both Stewart and Day are excellent in the second one, but number two does go on too long, and sometimes Hitchcock's attempts to "improve" uopon the original just means making it longer and stodgier, but both are well-made films. Looking over the various posters and ads for TMWKTM, I'm struck at the differences in billing the cast. Sometimes it's Nova Pilbeam/Peter Lorre/Leslie Banks/Edna Best, sometimes Banks/Best/Pilbeam/Lorre; a couple have Banks and Best above the title, Pilbeam and Lorre below, while Seattle's Orpheum names only "the dynamic new star sensation" Lorre. And that Spanish-language ad names only Pilbeam and Lorre. I guess actors didn't always get a contractual say in the pecking order.